Following one of the monster rules - Rule 17- 'A Monster can be sent to the human world', an invisible monster enters Moin's life. One night, in the dim darkness of his room, Moin heard something shuffling and sniffling under his bed. 'A bonster,' said a shrieky kind of voice. Moin flashed his torchlight all over the room. 'Abonster, where are you?' he asked in a wobbly wisper. 'A m-m-monster? Where are you?' asked Moin. The monster is invisible but he threatens Moin to draw him as per his instructions to make him visible. But monster finds Moin a challenged artist and Moin thinks the monster does not know how to describe himself. And the end result is a pink colour monster (since Moin ran out of purple crayon and found pink colour closest to purple), with autorickshaw horns, bamboo (drumstick) legs, broom like feet (skis in Moin's terms) - all of this giving him an appearance of rather funny than fearsome and a monster is supposed to be fearsome not funny. But this is not all. The monster rule 54 says : 'A monster has to stay forever with the human who has given it a body', which means Moin and the monster are now stuck together. The trouble begins for Moin as he has to hide the monster from everybody including his parents. Monster's extreme liking for bananas gets Moin into trouble and monster's craving to sing in (not so) melodious voice makes Moin's parents believe that Moin is very keen on learning music and hence music classes begin for him. One fine day, Monster decides to accompany Moin to school which leads to some very chaotic and hilarious situations in the school. The head girl considers the Monster as an illustration of an imaginary alien and chooses to stick him on the notice board along with the write up on the UFOs. 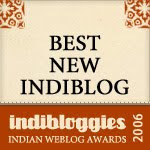 Even the principal Mr. KuttiKrishnan finds himself in some medical emergency - nothing short of madness, calls the doctor and informs him that he has been seeing pink things and hearing things. This is not all, the fun goes on till the very last page. 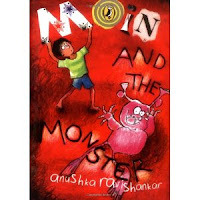 Anushka Ravishankar has successfully created the magic once again with 'Moin and the Monster', which will surely make children laugh heartily on almost every page. And lovely illustrations by Anitha Balachandran work wonderfully in tandem with the text. 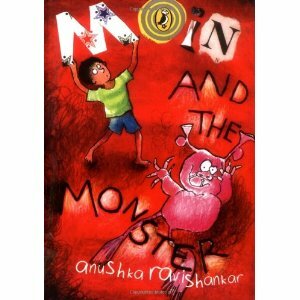 Clueless Moin while drawing the monster and the pink monster are really endearing to make the readers fall in love with them. The nonsensical verses that the monster loves to sing reminded me of Dr. Seuss's style. The five yo has been chortling away behind me and tells me by way of explanation that it is a "funny, really really funny book"